After two weeks of an all-out publicity blitz, the first round of the Chase Community Giving campaign has come to an end with Drum Corps International, several of its corps and strategic partners pocketing a total of $200,000 of $2.5 million available. JP Morgan Chase Bank's third installment of its Chase Community Giving promotion gave individuals the opportunity to decide how the company will allocate its charitable contributions. According to Chase, hundreds of thousands of charities with budgets $1 million to $10 million were eligible, but only the top 100 organizations will each receive a $25,000 grant as determined by Facebook users who voted from April 21 through May 4. With an impressive display of support, Drum Corps International and the four corps that were eligible to receive funding in this edition of the program mustered a combined 19,149 votes to all finish within the first 11 spots of the top 100. The corps each receiving $25,000 are the Blue Devils (Concord, Calif.), Cadets (Allentown, Pa.), Glassmen (Toledo, Ohio), and Santa Clara Vanguard (Santa Clara, Calif.). The Glassmen may have been the underdog story of the entire campaign. After amassing 300-some votes at the start, a technical snafu removed the organization from the Chase Community Giving Facebook page. Getting back into the running on April 29, with just five days to go, the corps made up a substantial deficit ultimately collecting 2,573 votes, good enough for the seventh position on the leader board. "Several of our corps have benefited since Chase started running this program in 2009," said DCI Executive Director Dan Acheson. "Now to have DCI and the four corps organizations finishing in the top 11 of the latest campaign, it's absolutely incredible—Thanks no doubt to the tireless support of drum corps fans across the country." Several like-focused organizations to Drum Corps International also fared well in the "Chase" with Winter Guard International (WGI), MENC: The National Association for Music Education, and DCI's Indianapolis neighbor Music For All placing in the top 20. Extensive cross-promotion by Drum Corps International and these organizations focused on music education advocacy helped all of the partnered groups climb the leader board throughout the campaign. "It was not surprising to see these music education organizations flourishing," said WGI Director of Marketing Bart Woodley. "I believe this is a testament to the power of marching arts participants and fans. With the funding challenges all of our organizations face, there is real strength in numbers." Woodley says that the $25,000 WGI will receive after finishing 16th in the first round will no doubt help the organization further its mission to support the performing arts. "There is a list of ideas a mile long that our organization has had to put on hold due to insufficient funding. Walking into the office was extra special this morning knowing a few of those things could be put into motion," Woodley said. All organizations that finished in the top 100 are now eligible for the second round of the campaign where Chase will be giving away another $2.5 million spread out among the top charities. Slightly different than round one, each of the 100 organizations must develop a "Big Idea" detailing in 1,000 characters of text or less and in a 30 second video, how they would utilize the top grant of $500,000 to further their mission. "We're currently in the development of DCI's 'Big Idea' for the campaign, which we'll be sharing with the drum corps community and the world in the coming week," said Acheson. Beginning Thursday, May 19, Facebook users will be able to view each organization's "Big Idea" to decide who they believe would be most worthy of the grant money. With five votes each, participants will have until Wednesday, May 25 to make their selections. In addition to the top grant of half a million dollars, runners-up ranked in the first 25 positions are qualified to receive additional grants ranging from $20,000 to $400,000. "There's a lot of good that can be done with these grants to ensure that the performing arts march on!" said Acheson. "We thank everyone for their support in the first round and look forward to what we can all accomplish together in round two." 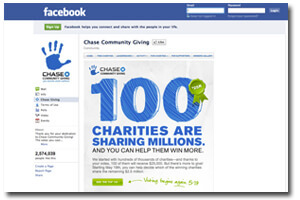 View the top 100 Chase Community Giving organizations on Facebook.